This webpage is dedicated to the BBC News presenter Katty Kay. In the UK she is known as a "female news presenter", someone who looks pretty and reads the teleprompters, but in America she is a news presenter for BBC America and she is a political pundit. Katty Kay replaced former BBC News presenter Mishal Husain. 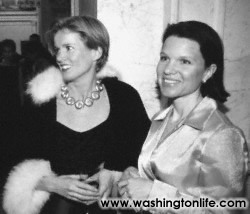 Katty Kay is based in Washington DC and it appears that she has become associated with the beltway insider pundit crowd. Katty Kay said the statement "[T]here's still bad news from Iraq, but it's not Americans being killed". Katty Kay made very offensive remarks where she blamed Ambassador Stevens for own death in Benghazi. Katty Kay smeared President Obama by saying he "can't empathize". Katty Kay's right-wing bias in her reports becomes apparent when she uses right-wing think-tank talking points. The right-wing pundits are comfortable with Katty Kay's right-wing leanings enough that they allow her to appear on their right-wing pundit round-table talking-point TV shows. When right-wing pundits like NBC's David Gregory and the Fox News shows invite Katty Kay to be on their shows, they know she's going to repeat a few right-wing talking-points that favor Republicans and bash progressives. When Katty Kay anchors the BBC News, she usually downplays any reports that could make Republicans look bad and invites "political analysts" from the same pool of right-wing talk show pundits that American shows use and lets them bash progressives. Katty Kay is supposedly a non-partisan foreign press reporter, but she repeatedly bashes Democrats like John Kerry with right-wing talking-points. Katty Kay is practically a Fox News correspondent and is proof that the BBC is not "liberal." Mishal Husain used to be the presenter for BBC News America until right-wing BBC pundit Katty Kay replaced her. The BBC used to be the only source of news that was free from the right-wing bias that American corporate news networks have. Before President Bush started his war in Iraq, a BBC reporter Andrew Gilligan reported that the British government had created a "dodgy dosier" full of false evidence to justify President Bush's and British Prime Minister Blair's preemptive war against Iraq. Though the "dodgy dosier" was later found to be based on a plagiarized 12 year old thesis written by a college student and all the claims of Iraqi weapons of mass distruction were found to be false evidence fabricated by the Blair government, the BBC was chastized by the Blair government for doing their jobs and honestly and truthfully reporting the facts. Gavyn Davies, chairman of the BBC board of governors, was forced to resign by Lord Hutton. The era where the BBC was one of the few bastions of truth on American TV was over. The BBC is now run by a more conservative administration that is less likely to report news that contradicts the official David Cameron government narratives. Mishal Husain, who had been reporting facts which contradicted the news spin shilled by American corporate news media, was replaced by right wing conservative pundit Katty Kay. Katty Kay pushes right-wing talking points, does not report on anything critical of the Obama and Cameron governments, features right-wing pundits as guests, and herself appears as a guest on right-wing roundtable discussion shows along with other right-wing pundits. Think about it: Katty Kay comes from a foreign country to help sell the Iraq wars, ignores anti-war protests in America, bashes progressives, and shills right wing talking points. When Americans get killed in Iraq, she says it's not "bad news" - her own words, look them up for yourself. She makes outrageous statements that would get anybody else hounded out of their jobs. BBC's Katty Kay: "[T]here's still bad news from Iraq, but it's not Americans being killed"
BBC's Katty Kay: "There is some sense in the States that people haven't been getting the full picture," Kay says, especially among those who feel "the administration hasn't always been quite straight with them." BBC's Katty Kay: "During the run-up to the war, Kay says, "some of the reporting became jingoistic," and she noticed "the extent to which the administration was being given something of a free pass." wealthy organizations hire Katty Katy to speak at their organizations' events. This is a way to bribe journalists into promoting various wealthy organizations' political and economic agendas in the journalists' broadcasts. For a price, Katty Kay can promote your political agenda. Most "journalists" who appear as political pundits in "roundtable discussions" on TV pundit shows get paid this way.